he Africa Twin is here, but how does it stack up against its rivals, the KTM 1190 Adventure R, BMW’s R1200GS and Triumph’s Tiger 800 XCx? We went on an 856-mile blast to Cornwall to find out. 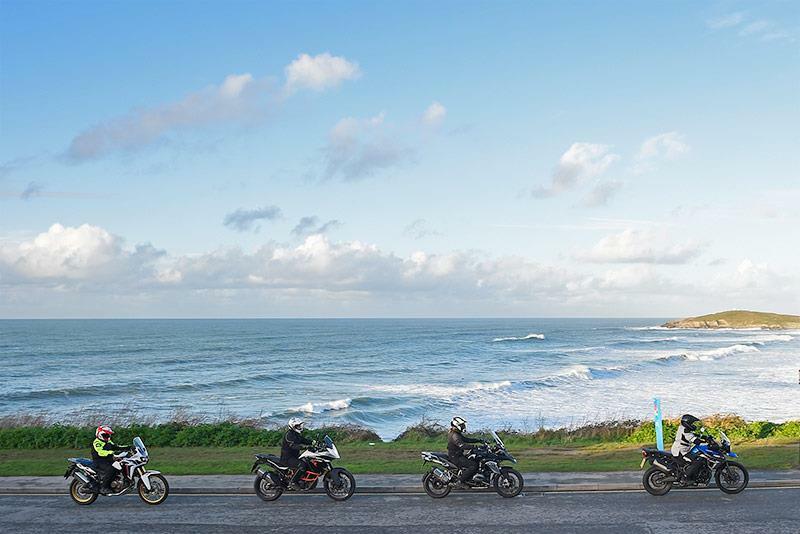 As dawn broke on day two, we headed to the dramatic coastline to watch some of the local surfers take on the huge waves and I took the chance to sit back and admire the four bikes. The Honda looks really impressive and seems to improve every time I give it a glance. 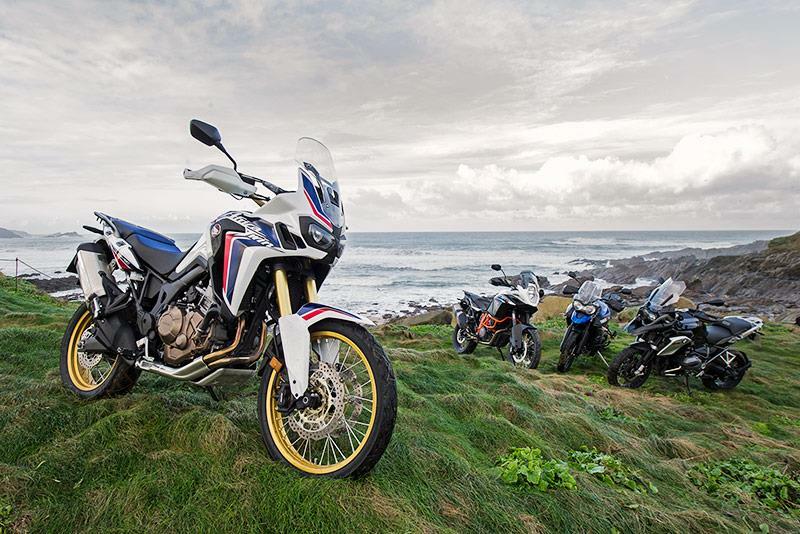 It’s the most off-road looking of the bunch, distinctive and very much an Africa Twin. I particularly like the sculpted front end, the colour-matched seat and twin-exit exhaust. The Africa Twin gets the thumbs up on looks alone. On top of the distinctive styling you have the excellent Honda build quality, and don’t forget that the Honda is only £10,499 – £3500 cheaper than the KTM and £4500 less than the BMW. But, crucially, it doesn’t look or feel it. There’s nothing wrong with the others on looks, either. The shaft-driven BMW has its own kudos, is the definitive adventure bike and over the years I’ve really grown to love the boxer. Even the design has grown on me. The KTM is very aggressive, bold and shouts ‘look at me’, while the Triumph is much more subtle, blending into the background. 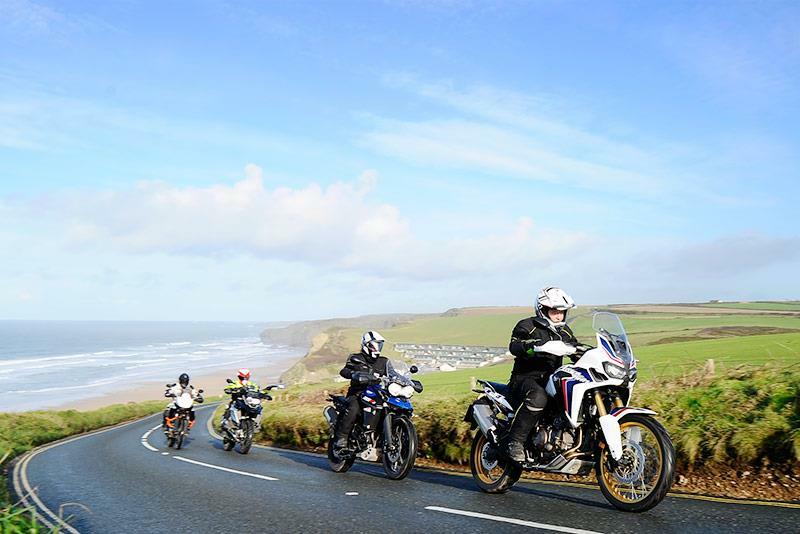 If you’ve never explored Cornwall then you’re missing out on some stunning scenery and roads to match. There’s everything from single-track hedgerow-lined lanes to smooth and fast B-roads, which dart inland from the coast. As we left the surf a small fight broke out for the KTM keys. Not only does the KTM have the most powerful engine by far, it also has an excellent chassis and is the only bike with cornering ABS, perfect for dashing around on unfamiliar Cornish back roads. But as the rest fought over the KTM key like seagulls over spilled chips, I quietly grabbed the BMW key. Our top-spec BMW came with ESA and the Dyna rider mode which means I can change the set-up and power on the move, something none of the others can, and it also means I have exciting power at the touch of a button. It may not have the outright power of the KTM but the water-cooled motor has more than enough grunt. Plus, the BMW was the only one with more conventional tyres and a 19in front, rather than 21ins like the other three. Never underestimate a well-ridden GS, they’re way more impressive than you’d think. The Honda was never far behind, boasting usability as its trump card. The Honda is more than capable of pushing the limitations of its off-road bias tyres rather than chassis first. The fuelling is perfect, I never wanted any more power and the huge spread of torque means limited gear changes. The ABS-assisted brakes are also excellent and really show how poor the Triumph’s are by comparison. But you could never describe the Honda as thrilling or exciting, not really. The KTM is fun and aggressive, it wants to party at every occasion, and the BMW will stick with it most of the way. As day two came to a close we headed back to Newquay and parked up at the harbour. We’d ridden every type of road imaginable, including some light off-road trails, and as the bikes cooled we swapped notes on the merits and faults of each. There’s no hiding the KTM’s size. I know this is because of its off-road DNA, but both me and Bruce really struggled on it. With my right foot on the ground I couldn’t reach or flip up the sidestand with my left leg, which gets a bit embarrassing. Its default is towards aggression, and it’s also a little lumpy below 3000rpm compared to the Honda. There’s no hiding the fact the BMW is also a big bike, but it’s slightly easier to live with than the KTM. Our biggest gripe with the BMW is price, at just over £15,000 in this spec, it’s a big outlay – although the residuals are also very strong. You can at least see where the money goes, the spec is impressive (and the base model is only £12,100), but the vast majority of customers will opt for the top-spec model. The Triumph feels top heavy, the brakes are weak in comparison and it’s the least comfortable. It’s not uncomfortable, but it was always the last choice for big miles. Nobody has any real complaints about the Honda, which is testimony to how good the new Africa Twin is. It may lack the BMW and KTM’s gadgets, but it is only £10,499. It lacks a bit of excitement, the motor is never going to thrill you, but how many Adventure bike buyers want that? 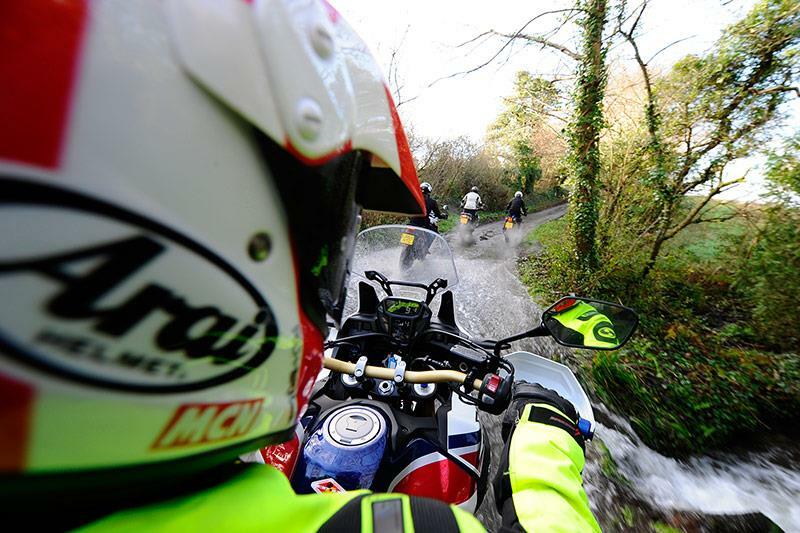 The Africa Twin feels very much at home off-road. Neutrally balanced and easy to manoeuvre, it’s less intimidating than the bigger BMW and KTM. Traction control and ABS modes are easily switchable on the move, but there are no alternate throttle settings. Much like the KTM, it has the real essence of a big trailie. 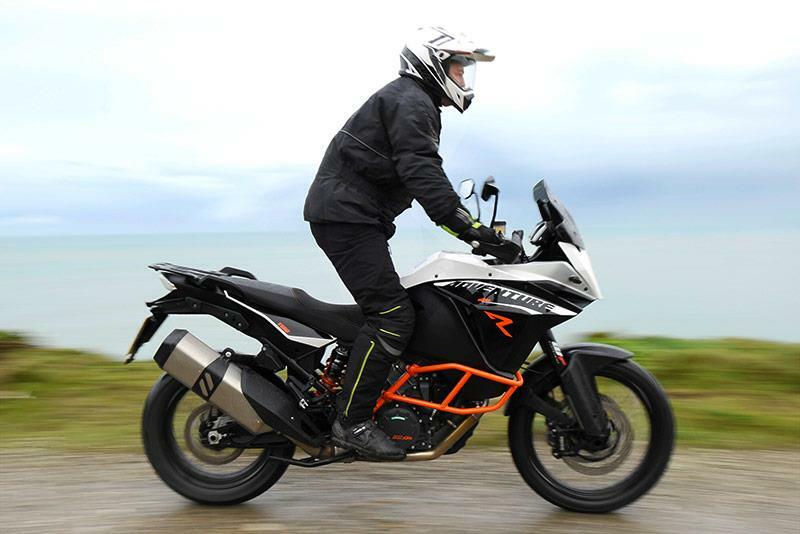 With its massive ground clearance and aggressive stance the KTM appears the most capable here. In Off-road mode the traction control system limits power from the ferocious V-twin but also allows for effective wheel slippage, as does the ABS, enabling the Adventure R to tackle pretty much any terrain you’re brave enough to throw at it. 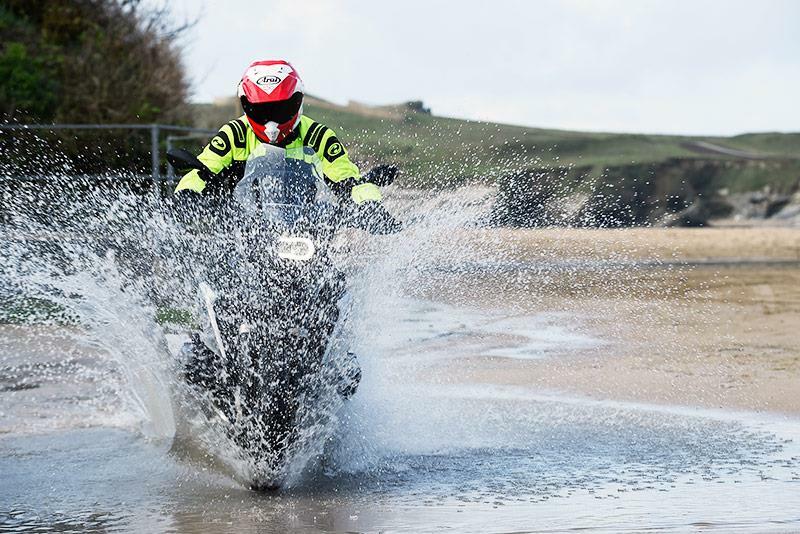 Triumph’s Tiger 800 also has an off-road setting that automatically adjusts throttle, ABS and traction control to suit. The riding position has a forward bias which, although not uncomfortable, is less natural. Although great on the road, the punchy triple lacks feel for work on the dirt, making it the least off-road-friendly of the bunch. 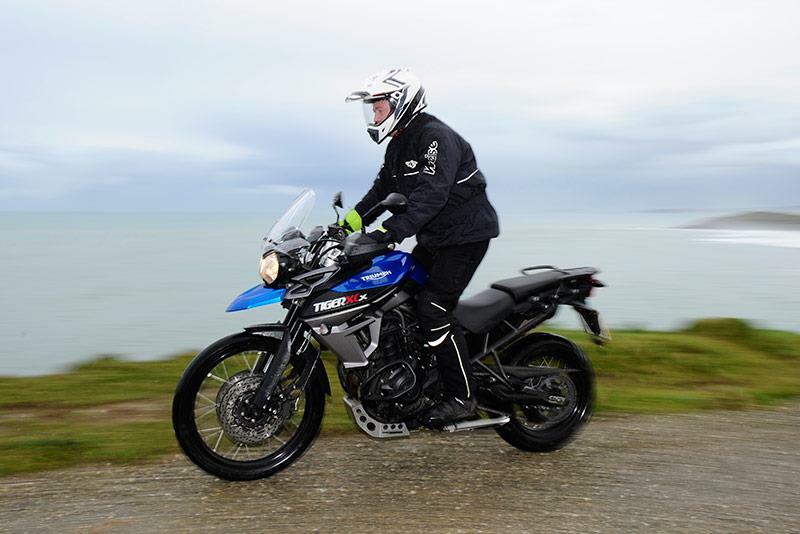 Selecting Enduro mode automatically sets the GS up for a surefooted and confidence-inspiring off-road ride. 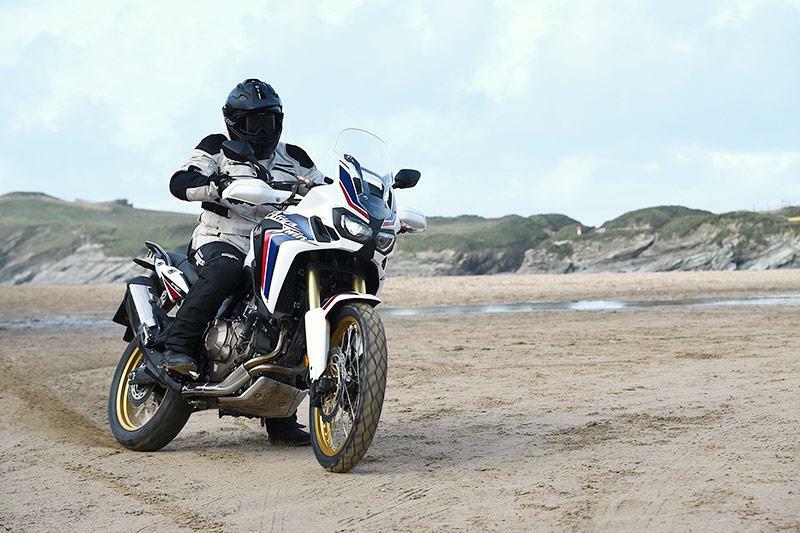 The ESA suspension and excellent throttle response help keep things manageable, and although the 19in front wheel can limit manoeuvrability, the big BMW is as trail-ready as ever, with rider aids that give you supreme confidence. The BMW and KTM are better bikes than the Honda, but they are considerably more complex and expensive too. If I were planning to do a big tour of Europe and beyond, the BMW would be my first choice. If I wanted something fun both on and off-road then it’s the KTM. The Triumph, while the motor is lovely, just isn’t in the hunt. But the Honda is batting way above its £10,499 price tag, it’s hugely impressive and if it was my money I’d be heading to the Honda showroom. On a more dirt-biased test it would shine even more.